Ladies and gentlemen, we are now on the prowl for a vintage suitcase that is oozing with character and charm. Why, you may ask? Well because of this utterly fabulous DIY Pet Project! How great is this idea? You take an old suitcase, build a little stand for it out of wood, upholster the interior so that it becomes the epitome of comfort and volia! 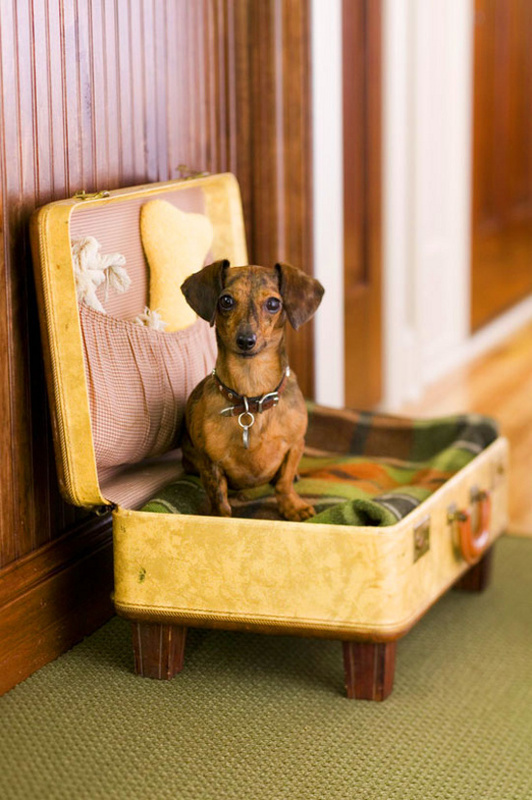 You have a pet bed that is pretty and portable! Leave the fabric pouch on the upper lid intact and you can pack up all of your dog’s toys and necessities, then close the lid and you’re on your way. Piece of cake, piece of pie — as easy as. Please tell us you are as besotted with this idea as we are! Seriously, we’re off to google fabulous vintage suitcases now! Ta ta!